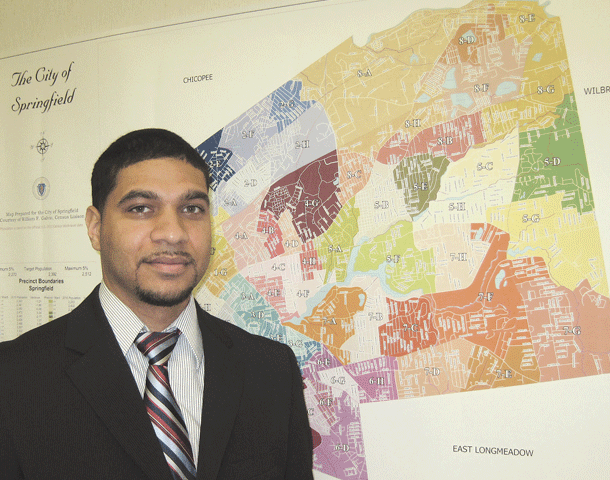 Single father Orlando Ramos has been able to fit his degree work around his full-time job and his new role as a Springfield city councilor. When Orlando Ramos of Springfield sits down to do his homework at the kitchen table, he’s often joined by another student — his 9-year-old daughter, Ariana. As she completes her fourth-grade studies, Ramos, 31, is completing his concentration in Public Policy at the University Without Walls (UWW), a degree that will allow him to reach his next goals of a law degree and a future in public policy making. Adults like Ramos who want to change careers or never completed their degree programs, for whatever reason, need flexible support in the way of process and cost. As the nation pulls out of the Great Recession, President Barack Obama recently challenged colleges and higher-education leaders to adopt promising practices that include functions like ‘competency-based learning’ and ‘experiential learning.’ Such practices award college credits based on what students have learned in life and work experience, and offer more opportunities for adult students to get financial aid based on how much they learn, rather than the amount of time they’ve spent in class. As one of the oldest alternative adult-education programs in the country, UWW is already at the forefront of meeting Obama’s challenge. Serving students in most fields available at the university, the unique program offers individualized degrees or course plans, 100% online, on-campus, or blended. UWW students earn a bachelor of arts or bachelor of sciences degree depending on the program they personally design, based on what credits they are able to transfer and what credits are attributable to experiential learning. As a single father with a full-time job, it hasn’t been easy, Ramos admits, as some of his study sessions end with him waking up with a textbook stuck to his face. After years spent in construction and as a union steward with the United Brotherhood of Carpenters Local 108, a back injury just before the recession started had him considering his future options. After earning his associate’s degree in Liberal Arts from Springfield Technical Community College, he was accepted at another school to continue his education. He soon found that right place at the right time in his life with UWW, and will graduate this May, according to a timeline he created. And timelines are important, said Cynthia Suopis, a senior lecturer in Health Communications at UWW. With the program for 12 years, she’s seen students like Ramos, as well as those in their 70s, who seek the degree that eluded them decades earlier. For Angie Boris, 47, of Grafton, a career change from a $60,000-per-year job to her own business that she sold after the birth of a second son led to pursuing her dream of becoming a teacher through UWW online — again, on a timeline that fit her changing lifestyle. All students, regardless of their story, enter into a process that allows them to evaluate and receive valuable credit for past experience; it’s called the ‘portfolio,’ and according to Suopis, it’s what sets UWW apart from all other online programs (more on this later). For this issue and its focus on education, BusinessWest visited UWW to learn about this 45-year-old program, which offers a customized and affordable plan for adult students who want and need alternative means to earn a degree, and academically sound credit reflecting what they’ve truly learned in life — and on the job. Founded in 1971, the UWW program was considered fairly radical when it was rolled out, said Suopis. With students ages 22 to 82, Suopis said the program has been a lifeline to individuals who have started and stopped school for families, experienced dramatic job changes, or endured hard times financially. But the philosophy of UWW is that, in addition to transferable courses from other schools, past work is honored, if it can be qualified. While other schools may look at a student’s résumé and check off the list what is comparable to the school’s academic requirements, the UWW curriculum requires the student to spend an entire semester dissecting their résumé and other life experience; that process is called building the portfolio. It’s a reversal of the term ‘service learning,’ which means learning that starts in the classroom is then put into practice in the community. At UWW, students are bringing the practical experience with them to learn more, but receive academic credits for that past expertise. Suopis explained that students with a minimum of 12 past college credits and a minimum 2.0 grade point average, once accepted, are required to accumulate 120 credits to earn a degree, or a ‘concentration,’ as the program labels it, and this can mean a focus on business, education, health, human services, or other fields such as journalism, criminal justice, public policy, sustainability, and applied psychology, all interwoven with their past experience. Up to 75 of those 120 credits can go toward the selected concentration, and they are accumulated through two means: transferred credits from another school (up to 30 credits for the portfolio), or experiential learning outside the classroom. Ramos transferred 47 credits and earned 21 more through his portfolio; Boris had 17 transferred, and her portfolio gained her another 18. Both have finished the four specific courses required of students, which entail writing the portfolio and designing their degree plan. The finished thesis is then evaluated by UWW faculty members, and not having to take classes for those credits saves not only money, but valuable time, Suopis noted. The revenue from the four courses, either online or blended, allows UWW to be self-sustaining; the revenue from the additional online courses through UMass goes to the university. • The portfolio class, which involves a semester of critically analyzing what they’ve learned on many levels in their past. The Reflections courses are not about content, said Suopis, adding that they are discussion points that impact students’ lives and help them write their portfolio. The first step is for the student to identify what they are good at, what they claim they know, and write about it. The writing process is a critical analysis that forces the students to pull out every minute detail of their past history and what they’ve learned, and in many cases, Suopis said, they are shocked to realize that they really did learn, and retain, a great deal of information and viable skills. For Boris, the portfolio process was overwhelming but quite revealing. Suopis said this is a common reaction, and one that helps build the confidence needed for the remaining work to attain a degree. But what about those students who are not skilled writers? By the end of the semester, after numerous revisions and edits, those fearful writers are proud of their accomplishments in the past, Suopis said, and their newfound ability to record it all for credits saves hundreds, if not thousands, of dollars and valuable time. The impact of the Great Recession is what prompted Ramos to alter his career plans. After his third back injury on the job kept him home for five months, and unemployment that followed due to a recession-prompted slowdown in the industry, he knew he needed to pursue a different, more stable path. When writing his portfolio, Ramos learned that his past was a foundation for his future. As a union steward, his main responsibility was to look out for the best interests of his union brothers, and little did he know back then that he was performing ‘constituent services’ — taking care of their issues and needs as a leader on the job site. And there were situations that weren’t all that easy to handle. Now as a district director for state Sen. James Welch, who represents the 1st Hampden District, Ramos stands up for Welch and his constituents. And as an newly elected Springfield city councilor, he’s standing up for the residents in Ward 8, which includes Indian Orchard and parts of Pine Point and Sixteen Acres, as well as all city residents with the entire council. UWW serves between 750 and 800 students each semester, with fully integrated UMass graduations of 150 per year at three different times: February, May, and September. The stories of why students of all ages come to UWW are numerous. For some, it may be their last, best chance to earn a degree. But when a student speaks of future opportunities and self-worth, Suopis knows she’s succeeded in guiding another student in their journey to what could be their perfect job. True to UWW’s website slogan, “we get adult students,” Ramos and Boris are good examples of non-traditional students who ‘get’ UWW, and are on their way to a future where doors will be opening because of their time spent at a university without walls.